This Depth & Complexity math word problem allows kids to explore their thinking while solving a real world problem. 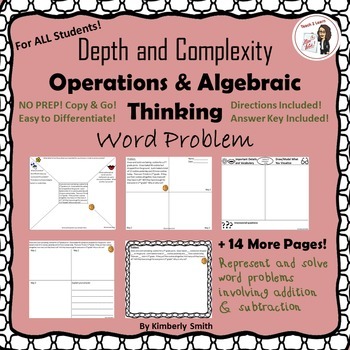 Not only will students be adding and subtracting, but they will also be examining the details of the problem, determining important math vocabulary, and solving the problem in different ways. 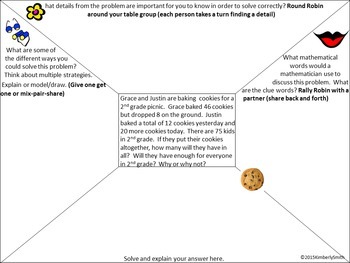 Students will also need to explain their thinking as they finally solve the problem. 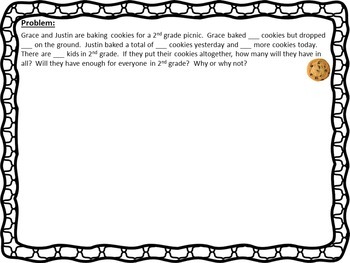 During the problem, students will be asked to figure out if two students have baked enough cookies for a 2nd grade picnic. They will need to add three amounts together, while also understanding when to subtract cookies that were accidentally dropped on the ground. Students will be given the total amount of 2nd graders but will need to determine if the total they calculated will be enough for all. Can Anyone Use Depth and Complexity Frames? Yes!! Although these lessons are designed for GATE students, I still use them with my "Non GATE" learners, and they really enjoy it. 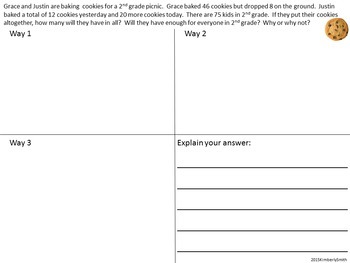 Teachers have the choice of using this as an independent activity, an assessment, as a math center, or as a way for kids to work together cooperatively, as one of the sheets include cooperative learning structures. This allows the kids the opportunity to verbalize their learning and communicate like mathematicians. I have included several different template/layout options to use for your preference. You can even use the different layouts to differentiate for your kiddos. Also included is the option to write in the numerical amounts used in the word problem should you want to increase or decrease the numbers given. This will also give you the opportunity to use the lesson again, but by changing the quantities, you have a whole new lesson! to solving 2-3 step problems. It can also be used as a mid-assessment or as a CGI problem in which kids have to show their answers 4 different ways. You could even use this as part of a math station! :) Have fun! click it to become a follower. Voila! You will now receive email updates about this store .